For a long time Lonmay Parish Church was linked with Rathen West Church. 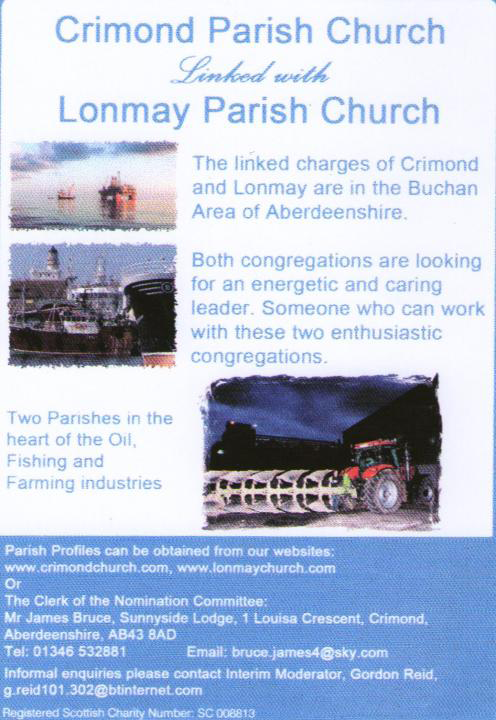 After the retirement of their Minister 14 years ago, Presbytery decided to break that link and Lonmay was subsequently linked to Crimond and St. Fergus in 2002, with all three churches having Ministers and Readers providing pulpit supply. With time, however, Presbytery realised that a tripartite charge was unattractive and, in 2008, a link was formed between only Lonmay and Crimond. It has been a challenging time without a Minister, but, thanks to the dedication of the Kirk Session and the support of Readers, Lay Preachers, Interim Moderators and, more recently, the Locum, the congregation has remained faithful. The affiliated organisations have also maintained a healthy membership and some have even increased their numbers. It was in September 2011 that our Locum was appointed. He takes 3 out of 4 Sunday services each month, and carries out pastoral duties and funerals. The continuity, encouragement and support provided by the Locum have been much appreciated. The first Parish Church was built in St. Combs, when the village consisted of only a few houses, but, as the population increased, the building became too small and it was decided to build a new church and locate it more centrally within the parish. In 1788 the church was built in Lonmay. Two years previously, the nearby Loch of Strathbeg became land-locked as the result of a severe storm and the cargo of slates from a ship that had become marooned in the Loch was used for roofing the new church. By 1870, church attendance had increased so much so, that a new wing was added to the church. In recent times, a considerable amount of money has been spent on the fabric of the building, including the installation of heating and double glazing, disabled access and toilet facilities, redecoration and on the purchase of a new organ. Weekly services are held at 12 noon each Sunday and communion is celebrated twice a year. Many services are accompanied by PowerPoint presentations, which facilitate a wider range of services and encourage the congregation to feel more involved in the service. The Sunday School and parents are involved in special services at Christmas, Easter, Harvest Festival and June, at the end of the Sunday School session. Boys’ Brigade and the Guild also take an active part in their dedication services. Members have an added opportunity to enjoy fellowship and to meet socially, when soup and sweet is served after the morning service on the first Sunday of each month. 20 children regularly attend Sunday School (The Kirkie) in St. Combs when they are not involved in special services at the church. Sunday School is held each Sunday during term time in the small hall at The Kirkie in St Combs. Up to 20 children attend, and are well supported by parents. They have a Bible story with relevant songs and activities in a large group then split into two smaller groups with the older children looking further into the bible story and relating it to their own lives. At this point the younger children take part in more practical hands on activities or movement activities linked with the chosen bible story. There is also singing of Junior Praise hymns or other songs chosen by the children to fit the theme. The session always closes with a prayer and on frequent occasions this is either chosen or written by the children themselves. Four times a year they attend Lonmay church where they often present a ‘play’ based on the stories that they have learnt that term for the fellowship. This is always greatly appreciated. Attendance is regular and for a small area is well supported. In addition, there are three family services held each year, to which the children and parents are encouraged to attend. Messy Church meets monthly in The Kirkie, St. Combs, and involves children, of Primary School age and younger, and a parent. The basis of Messy Church is to share Bible stories/characters in a way which involves everyone. Normally after an opportunity to share, the theme is introduced to encourage everyone to think about what is going to happen. There are then four different activities for everyone to complete, along with optional colouring sheet and Word Search puzzle. The completed activities are then brought together to provide visual aids for the story. This is shared in a variety of ways. After a song and prayer, light refreshments are served. Being held in the village, enables families to attend once children have been home from school to change. The 1st St Combs Boys’ Brigade has been in existence since 1934 and is one of the few companies to carry on throughout the Second World War. The company of 33 boys meets in the St Combs Community Centre. This is a fantastic centre with excellent facilities. The boys meet on a Tuesday evening between 6 and 9 p.m. with the three sections, Anchor, Junior and Company Sections. The programme is varied and attractive and is a mixture of drill, physical times and badge work. We are working hard to recruit additional helpers and lads. They are affiliated to the Buchan Battalion which consists of 10 companies. In addition to their normal activities, they participate in most of the Battalion events and attend Lonmay Church for their dedication service and for special services such as Armistice. The Over 50’s Club meets fortnightly in the St. Combs Community Centre with approximately 50-60 people attending including a few from outwith the village. In addition to a variety of speakers and entertainers, they enjoy concerts by the local school pupils and bus runs in the summer. Lonmay Guild membership is open to anyone wishing to share in supporting the Church and each other through worship, fellowship and service. We meet monthly from September to May (see syllabus for changes) in the Church Hall. Each meeting begins and ends with a short time of worship, usually centred on the Guild Theme for the year and the speaker or activity for the evening is also linked to the Theme or Discussion Topic. An Open Evening is arranged each year in support of one of the Guild Projects. Fellowship is enjoyed during tea and refreshments served at each meeting, at the Guild Week Prayer Lunch, the Christmas `Pot Luck` meal and when meeting up with St. Fergus Guild for a meal out at Christmas and a summer outing. Guild members also attend Presbyterial Council meetings with a variety of interesting speakers and join with Lonmay Work Party members to plan fundraising events and enjoy outings. New members are always very welcome, so please come along and join us at 7.00 pm on the first Monday of the month from September to May. This takes place on a rota basis and members, along with friends from Crimond Church, attend the local hospital on a Sunday evening singing hymns to patients on the wards. This is really appreciated by the patients who are able to choose hymns. The club is held monthly from September to March in Lonmay Hall and is open to all members of Lonmay and Crimond Churches and their friends as well as other supporters of the church. It features different aspects of cooking with a view to encouraging more adventurous meals as the ingredients/dishes are suggested by the members themselves. It has been well supported by all ages and both churches since its inception in 2014. The main theme of the club is to explore new foods and tastes as all dishes prepared are consumed by the members during the evening, as well as forging many new friendships within members. A two year Action Plan, based on the results of an questionnaire completed by church members, was developed in 2012, approved by the Kirk Session and distributed to all members. The plan was reviewed 3 times a year, with the final review of that plan completed in May 2014. At that point a new 2 year Plan was agreed for the period 2014/16, the latest review of which was completed in April 2015. The parish of Lonmay covers an area of approximately 20 square miles. It stretches from St. Combs by the sea in the north to its southern boundary at Kininmonth. The history of St. Combs is linked to the fishing industry, but now most of the working population are employed in the nearby towns of Fraserburgh and Peterhead and on oil rigs off shore. From St. Combs (population 850) a sandy beach stretches 5 miles south to Rattray Head, with the Loch of Strathbeg R.S.P.B. Nature Reserve on its landward side. Further inland and towards the West and South, the parish of Lonmay supports around 40 farms, which pursue both arable and livestock production. In the fertile soil the famous Lonmay potatoes among other things flourish, and Buchan beef is also a well-known product of the area. There are two primary schools in the parish, one in St. Combs and the other in Kininmonth. Older students have access to three Secondary Schools on Fraserburgh, Peterhead and Mintlaw, and a FE college in Fraserburgh. In St. Combs the Assembly of God have a small hall and services are held there on Sunday and once during the week. Gospel services are also held in a recently built cafe, which also offers meals and snacks during the week, and in The Kirkie, an old established hall, where various preachers offer an evening service every Sunday. A new purpose-built Community Centre opened this year, and accommodates a number of community groups, including the Boys’ Brigade, and provides a venue for some church events too. A well-established and well maintained rural hall in Lonmay, approximately quarter of a mile from the church, is used for badminton, bowling, community events, for example the church quiz, and private functions. There are also two hotels in the vicinity, The Tufted Duck in St. Combs and the Ban Car at Lonmay, which are extremely popular for weddings etc. For the outdoor person, there are several golf courses (including one at nearby Inverallochy), playing fields and play park facilities, as well as opportunities for walking, surfing, wind surfing, kayaking and all types of fishing. There are also modern sports facilities, including a top class swimming pool, in the newly opened Community Centre in Fraserburgh.